The leading specialist in office design, project management, fit-out, M&E works, refurbishment and office furniture supply in Romania. Company’s mission is to transform ordinary offices into efficient working environments in Romania. COS is part of Office Solutions Group, an office interiors consultant since 1997 and now one of the largest in Central and Eastern Europe. AVITECH is one of the most important integrators of solutions and systems designed for BMS (Building Management System), automations, electrical installations, security, safety, audio-video, videoconferencing and IT&C. It is our intention to meet our client’s needs with high-performance equipment, integrated systems and state of the art technology. Even more, we have committed ourselves to bringing added value through complete solutions and complex services, complying with the highest quality standards. Liberty Technology Park Cluj is a park for creative ideas, a tech park that offers exceptional growth and quality environment for companies in the IT&C domains, all in one unique area both conceptually and architecturally. The project will design a dynamic ecosystem for local and international companies driven by that particular vision that makes ideas come to life and businesses thrive. Liberty Technology Park Cluj is a project developed by Fribourg Development, the real estate division of Fribourg Investments, the investment fund controlled by the businessman Ion Sturza. NIBA Sistem Ltd. provides consulting solutions in energy efficiency both for newly constructed buildings as well as for existing ones. Company professionalism is based on experience in developing complex projects on Energy Audits and thermal design of the rehabilitation of apartment buildings and retail-education-health buildings, Energy Certification of various buildings at the end of the reception for building works , Energy Certification of apartments at sale, Infrared thermographic inspections. In the company there is also ,, The Green Building Certification ” department. This department specialists are accredited as ,, LEED Green Associates “. Project beneficiaries are both private companies and public entities , NIBA Sistem Ltd having an extensive experience in public procurement auctions . Our company is an official representative of Clina Germany. Our products are the gold winner of the Paris Interclima competition. We are proud to have clients as the German Parliament. In Romania we have many references as well. Clina capillary tube technology takes a completely new approach and follows nature’s example. The transfer of energy between users and the activated surfaces is achieved predominantly using radiation – matching the natural conditions for regulation of the heat balance of all living organisms. With our system, buildings reach high energy efficiency andperfectly fit the green energy prescriptions. Company specialized in offering consultancy services in energy efficiency. Our specialists cover the areas: Energy Certification of houses, apartments and social-administrative buildings, Energy audits of buildings and installations for thermal rehabilitation, Infrared thermographic inspections for buildings. In 2012 we founded the department of Consultancy for certifying green building (certification systems LEED, BREEAM or DGNB). WE WISH YOU A WARM WELCOME WITHIN OUR NETWORK! In a position paper released on 31 January 2013, the Europe Regional Network has called on European policy makers to send a strong signal to the investment community about the building renovation agenda. As leaders prepare for the EU Budget summit on 7-8 February, and debate on the future of the EU’s carbon market continues, the Network has highlighted a challenge that member states are just starting to discuss: establishing long-term national strategies to mobilise investment in building renovation, in accordance with the new Energy Efficiency Directive. With just over a year to establish the first national renovation strategies, matching strong public funding programmes with the private capital needed to unlock the energy reduction potential across Europe’s buildings will be crucial. Leaders now have the opportunity to earmark EU funding for energy efficiency and renewables in buildings, as well as to strengthen and utilise revenues from the EU Emissions Trading System (EU ETS) to back national renovation programmes. “Over the coming months we will be working with governments and stakeholders from around Europe on how they approach the challenge of creating national renovation strategies. Governments need to start this year by sending a signal to the investment community that this is an agenda that governments are invested in for the long-term. The Budget summit and EU ETS reforms are the right places to start”. Article 4 of the Energy Efficiency Directive requires that countries establish a long-term strategy to mobilise investment in the renovation of the national stock of residential and commercial buildings, both public and private, by April 2014. The Building Performance Institute Europe’s analysis of deep renovation scenarios of Europe’s building stock demonstrated the potential for net energy cost savings is as much as €1,300 billion. See HERE largely content of the letter. 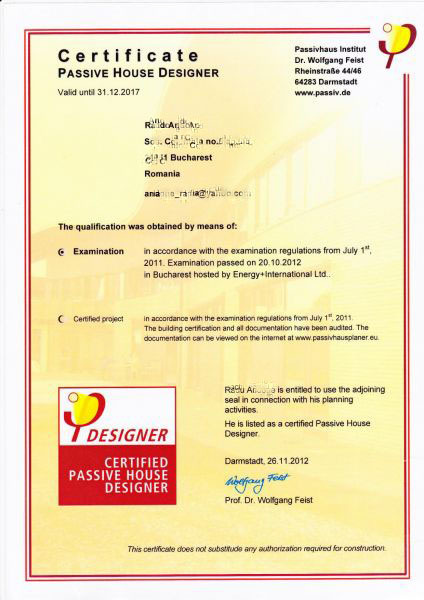 In November 2012 have been confirmed by Passiv Haus Institut (PHI) Darmstadt, a number of eight new romanian specialists in passive houses. 3) a passive house project. He was held under the supervision of a representative PHI Darmstadt. The graduation requirement to pass the exam is to obtain at least half of the total score. Assessment examination was conducted in Germany, and after about 4 weeks after the examination, each participant received a notice from PHI Darmstadt on the exam results. Those who have passed the exam have received by mail a certificate of recognition skill levels, similar to the one bellow.